Transdifferentiation of precursor cells into fibrogenic myofibroblasts. Upon parenchymal injury, the wound-healing response leads to the release of fibrogenic growth factors and cytokines, the most prominent of which is TGF-β1. 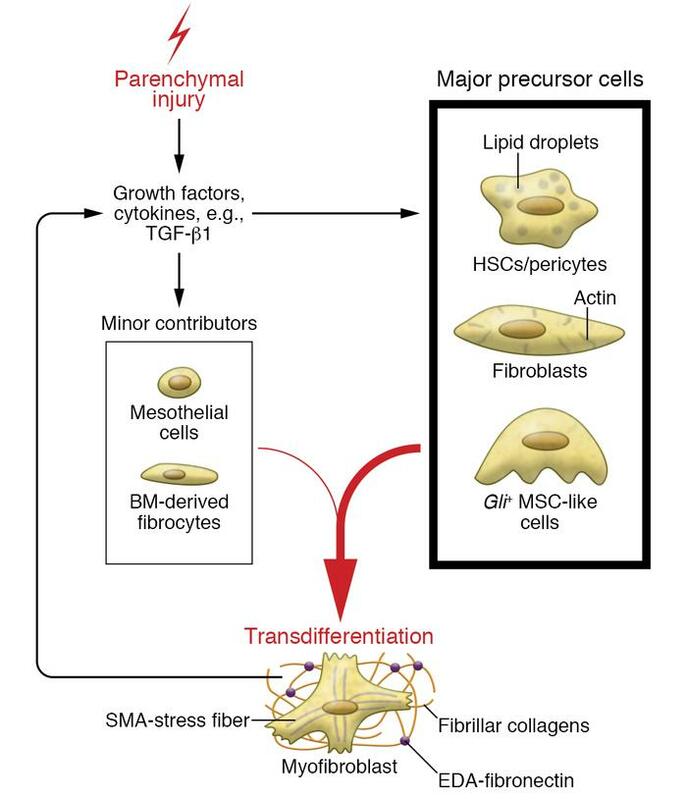 These factors drive the transdifferentiation and proliferation of precursor cells into myofibroblasts. Major precursors of myofibroblasts are cells of mesenchymal origin, including resident fibroblasts, pericytes, and Gli+ mesenchymal stem cell–like (MSC-like) cells. In some cases, myofibroblasts may be derived from bone marrow–derived (BM-derived) fibrocytes or through mesothelial-to-mesenchymal transition (MMT). Myofibroblasts produce ECM comprising fibrillar collagens that undergo extensive cross-linking and EDA-fibronectin, which promotes TGF-β1–induced transdifferentiation.